The Awesome Summit of Awesome! 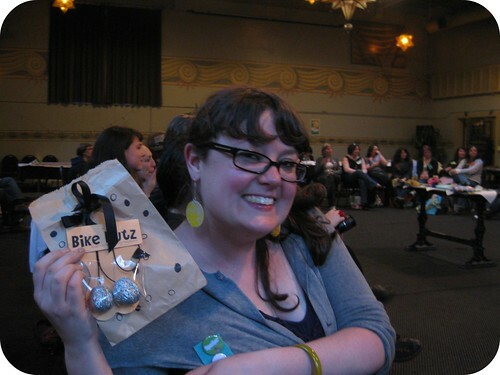 Week before last I attended the Summit of Awesome in Portland, OR. 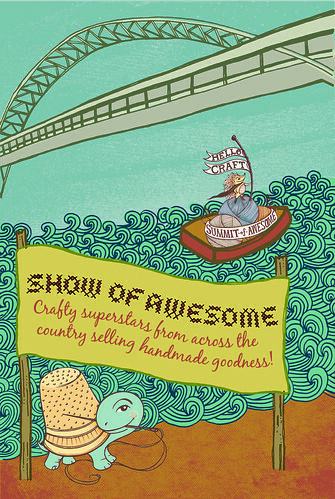 The event is produced by the lovely ladies of Hello Craft and I've had the honor of attending both last year and this. And not just the honor of attending, but the honor of being involved. 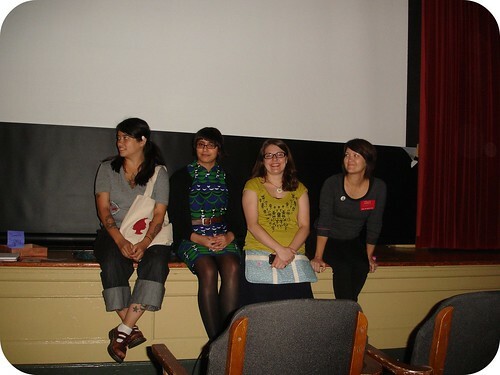 Last year I spoke on a panel discussion about organizing a craft market and I taught a hands on screen-printing demo. 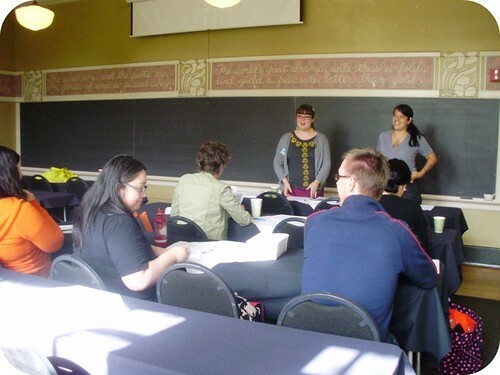 This year I spoke on event sponsorship and taught the screen-printing demo twice. I'm so proud to say I was a part of the action! 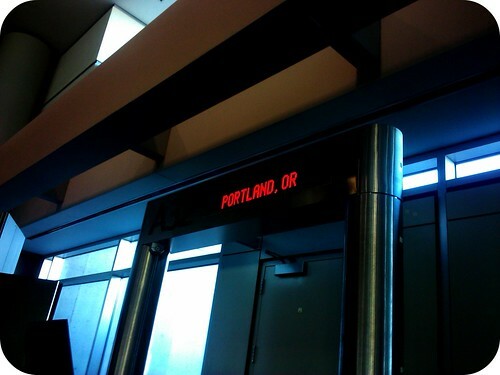 This was my first visit to Portland and just getting there turned into quite an adventure. Prior to our flight, Becky, of Glue and Glitter fame, and I stopped by a bar next to our gate and had margaritas to kick off the exciting trip. 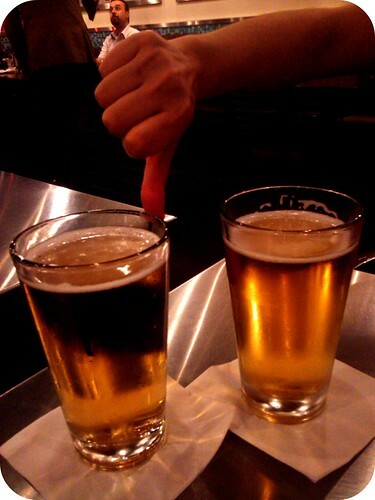 A bit later, we sat forlorn in another bar drinking beer. Thunderstorms in Atlanta meant our flight was delayed by hours. We didn't know when we would be taking off and were more than a bit nervous because this meant we were probably going to miss our connecting flight in Denver. Yeah so that happened. We missed our flight in Denver. And consequently ended up sleeping on the floor of the Denver airport. It seems funny now but it wasn't exactly comfortable. I think I got about 1.5 hours of sleep. We were on standby for an 8:30 am flight and had confirmed seats on a noon flight. If we landed on the noon flight I would miss my first screen-printing demonstration and Becky would have ended up a few minutes late for her panel discussion on greening your business. Once we landed in Denver we went straight to the gate of the 8:30 flight, the one we really, really wanted to end up on. Funny that we felt that it was necessary to sit and sleep at that gate a good eight or so hours before they were boarding that flight because they were doing construction on the ceiling nearby. All night I could hear a lift going up and down and the men working. It just seemed right to stick with that gate, it was our only hope! Flying standby is nerve racking and when they called the names of three passengers I felt certain we hadn't made it on the flight. A few minutes later they called our names (or some butchered version thereof) and we were on the early flight! Crisis averted! My wonderful-fabulous hostess, Cathy, picked us up from the airport and drove us straight to the Kennedy School, which is the coolest venue, and we had time to eat, freshen up and relax for a few minutes before jumping into the festivities. I made it on time to teach screen-printing (and made sure to tell everyone that I'd had no sleep so if they didn't follow my explanation that was sure to be my fault and to stop me!). 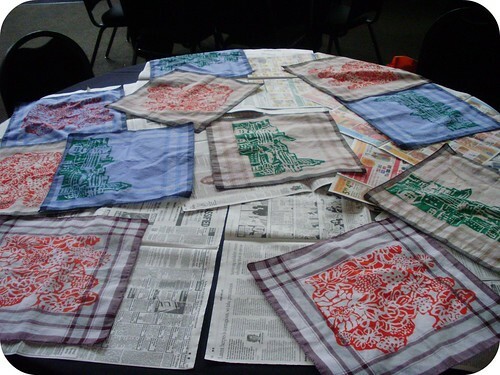 Everyone made beautiful prints and there was much enthusiasm for screen-printing! Becky made it on time for her green panel discussion. And all was finally right with the world after grueling travels. We were at the Summit of Awesome and it was time for awesome to begin! That night we attended the opening party complete with screen-printing t-shirts and a white elephant gift exchange. 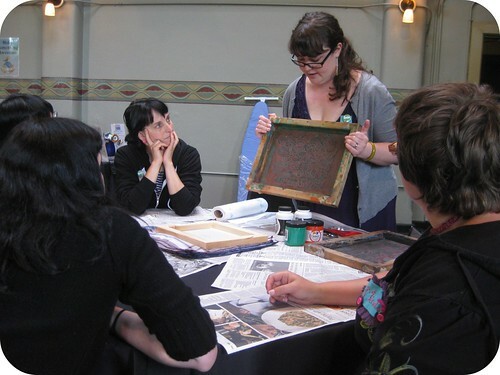 The next day, I taught screen-printing again and attended a talk by Kari Chapin, author of Handmade Marketplace. She wove the story of writing her book in with questions the audience had about getting their crafty business going, which I found really inspirational. Next up, more inspiration! 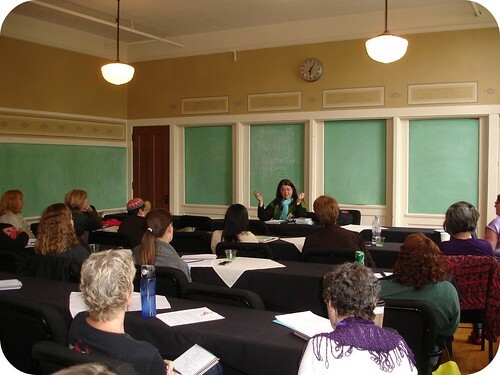 I attended Sister Diane's workshop on getting your blog in shape. 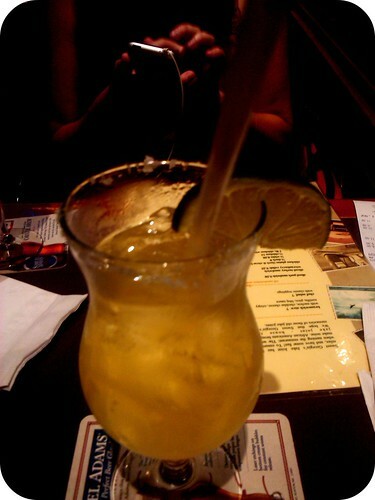 I felt totally reinvigorated by Diane's suggestions and some compliments I received from the other ladies in the class. The workshop was also super exciting because Diane was on my list of people in Portland that I was determined to meet "in real life," along with Heather and Kyle. I managed to meet all three! I also learned about wholesaling and selling online that day. During lunch, we enjoyed hearing the story of Buy Olympia from its founders, Pat and Aaron, and later that night we got to visit Land, their retail store and gallery. On Friday, Kim Dorn and I spoke on event sponsorship. I know a lot, but I gotta hand it to Kim for knowing tons. I was literally scribbling notes and presenting at the same time! 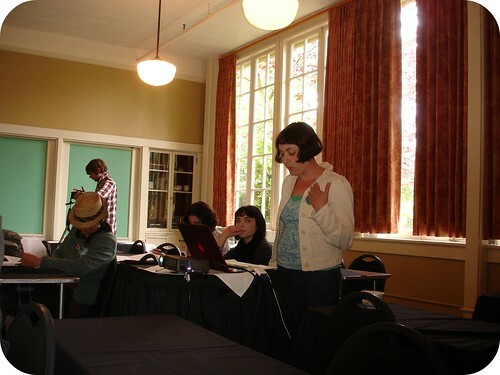 Then I learned a lot from Torie and Cathy of Crafty Wonderland and Jamie of Bazaar Bizarre San Francisco as they spoke about event organizing. I love to talk shop with other organizers and to hear their challenges and successes. Lunch included inspiring tips for productivity with the very funny Mark Montano. Later I learned about all the many options for credit card processing from Willo and Caitlin. 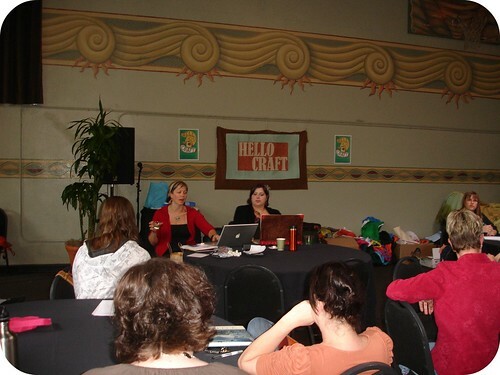 The Summit was closed out with final words from the adorable ladies of Hello Craft. 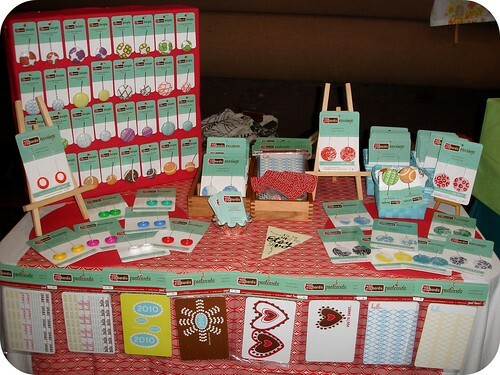 On Saturday, I was a vendor at the Show of Awesome, a craft market with 40 vendors at the Doug Fir Lounge. 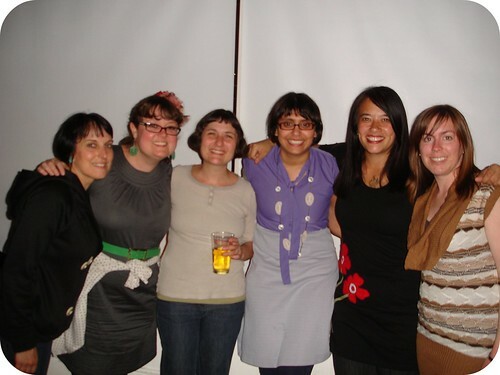 The show was organized by Torie and Cathy of Crafty Wonderland and Jen of DIY Lounge. 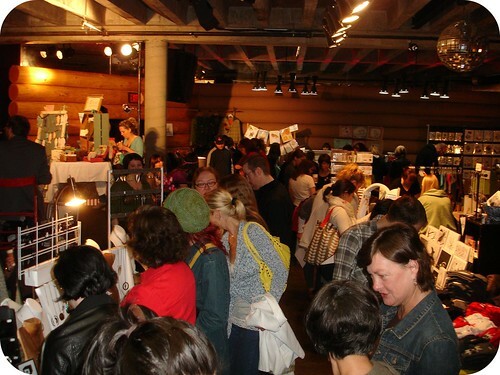 A lot of Portlanders came out to the craft market as well as people who had come to town for the Summit of Awesome. I was super excited to be one of the vendors because the line-up was so amazing. Here is a shot of my booth. The PDX awesomeness came to an end with a little down time with my hostess, my travel companion and most of the ladies of Hello Craft. The Summit of Awesome was awesome (duh) and I can't wait until next year! To see more of what happened at the Summit of Awesome, visit the Flickr pool.